Can you teach what you don’t understand? I was put in mind of this question when I read some comments a colleague had made about board-breaking. Breaking boards is unquestionably an exercise in physics. But my colleague, through his remarks, revealed that he didn’t quite understand the physics involved. Now, he is an excellent martial artist and a fine instructor. Furthermore, if students followed the practical instructions he was stressing at the time, they’d probably be helped in their chances of breaking their boards. The only problem would come if they relied on his underlying explanation when taking a physics test. And if they were taking a physics test, they would most likely have already figured out his mistake… No harm done? In fact, the physics of board-breaking is an area where many good instructors have gaps in understanding. Everyone throws around “F=ma” and talks about acceleration, usually with the idea of ‘acceleration’ as ‘picking up speed,’ and ‘mass’ as ‘how much you weigh.’ Technically, these ideas don’t offer a complete, accurate account of what’s going on, but if you can get your students’ techniques to pick up a lot of speed and make effective use of their body mass on the way to striking a board in the right place with the right surface — you’ll have helped them succeed. At the same time, too much technical knowledge can get in the way. Some of the most unhelpful instructors I’ve known, with respect to board-breaking, have been engineers. They’ve known their basic physics, and have insisted on principles that would apply if a rigid steel battering ram were being driven on a horizontal plane into a board. If you’re talking about getting a human body part to crash optimally through a stack of wood, things are more complicated than that. Biomechanics are involved — bones, muscles, joints rotating various ways, varying degrees of flexibility and strength. A human body kicking is not a battering ram on a straight path, and if you try to get it to act like one, you can really cramp its power. The non-engineer, without preconceived ideas, may do better in helping the student generate more force through an excellent technique suited to that student’s body. Even a biomechanical engineer with all the right knowledge and understanding (if there is such a person) might not have anything over the non-engineer instructor, where teaching martial arts is concerned. That is, they might be able to describe what happened after the fact, but they might not have any advantage in getting the student to perform better. Martial movements exist only in their performance; they are learned through repetition and feel. 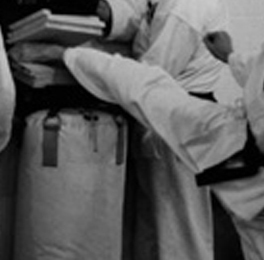 The martial artist need not understand the underlying physics in order to embody it, and teachers or coaches just might not need any of that understanding to do their jobs. Lacking the understanding, they can still make effective use of terms and concepts, more or less as metaphors to help students imagine what they need to do. Another idea that’s often used in martial arts instruction, but just as often (I’m willing to bet) not understood, is the concept of ‘ki’ or ‘chi.’ There are those who don’t believe in the first place that it’s something “real,” but even the fervent believers are hard pressed to explain it. Yet (I’d argue) it’s used very effectively by many instructors to help their students improve technique. Through exercises in visualization (like “the unbendable arm”), and exhortations that may be more metaphorical than anything else (“relax; use your chi!” “flow your ki;” “use ki, not muscle!”), instructors manage to get students to reserve energy, move easily, and generate effortless power in their techniques. One could argue that they are getting students to “flow their ki,” whether or not that’s something either party really comprehends. But what do you think, readers? Can you teach what you don’t understand? This entry was posted on May 2, 2010 at 11:28 pm and is filed under martial arts, teaching with tags board-breaking, chi, ki, physics. You can follow any responses to this entry through the RSS 2.0 feed. You can leave a response, or trackback from your own site. I was just pondering the benefits of board/block breaking this last week. Frankly, I’ve never practiced that, and as such have done the normal thing when I don’t fully understand something, I dismissed it as irrelevant. I train with various makiwara and other traditional type tools, which I feel has developed considerable focus and power in my techniques. However, I felt a ‘check’ when I was turning my nose up at the notion that breaking was relevant. What am I training for? Ultimately, it is to break a human body quickly and efficiently, to put it crudely. Breaking appears to require a full commitment of speed and power past the point of impact. Just the few videos on YouTube I watched was enough to convince me that I need to add this as a test of my training. And to answer the question, I think it’s possible to teach something you understand but are unable to perform, but impossible to effectively teach something you don’t understand. Like the non-engineer instructor, we can teach things that we understand in our bodies. Teaching sometimes becomes an act of discovering the words or uncovering the communication skills to teach a principle or action. But understanding that is mental or imagined or believed: these things are not effectively communicated because they have no ground substance. It is very much so – and many of the best experiences of teaching are when it’s discovery for the teacher as well as the student. Some other factors involved in the equation that the engineers can’t take into consideration are the human brain and the nerves connecting to it. The brain can be your most powerful weapon or your worst enemy. The nerves? Well, they tell you when something hurts and the human brain, many times, will tell you it’s going to hurt before you even try. Good point! Thanks for the comment. There is a lot more going on in board breaking than just physics — there is also physiology. Bone is comparable–and in some ways superior!–to concrete. It also gets denser through repeated stresses like punching, weigh lifting, breaking, etc. As part of my black belt requirements I had to teach low belts. I could teach any beginner how to break a board with their elbow or foot. Give me a week and they could do it. At some point, however, it becomes more than just physics and physiology — when you start talking about stacks of five or more boards or stacks with no spacers it becomes a refined skill and art. You have to have mastered the technique, mastered your nerves, be totally relaxed, and know how to generate power. Moreover, on thick stacks the margin of aiming error is pretty small. Basically all this has to come together at once! Some martial artists excel at this while others never master it. Thanks for that bone link. Interesting stuff! Surprised to see it’s on a so-called “creation science” website. I don’t endorse their conclusion, but the facts do merit some awe. Martial arts are a practical activity, hence what counts is effectiveness and using ones body in the most efficient way possible. Theory is superflous in that it doesn’t add anything to a technique’s effectiveness which is optimalised through practice and experience: how does knowing a mathematical formula help in that? Knowing how the body of a highly trained athlete works isn’t going to make you one and the masters of old sure as hell didn’t know physics (Newtonian mechanics didn’t come about until the 18th century with the scientific revolution) yet they were so effective they survived the worst and most dangerous situations imaginable. I think trying to approach your training with a scientific mindset (‘I want to know exactly why this works, preferably with reference to the laws of nature’) and too much emphasis on theory (thinking over doing) will actually hamper your growth instead of improving it: do your equations later if you must but on the mat there is only training and listening to your instructor (who practiced for years and listened to his instructor), nothing else. Fighting is an inherently intuitive activity and rational thought only clouds ones judgement and slows ones reactions: feeling is the most important thing in training and ones level of skill is measured by immidiate reaction to a threat and confident, flowing, natural movement born out of an intuitive comprehension of the situation. Science is analytical and rational, MA fall more in the category holistic and intuitive. As to the concept of ‘ki’: I don’t know what to think of it but I treat it as a means to describe or name the result of efficient action: the best result with the least amount of energy which is what I strive for in my training. Whether this can be explained in mathematical formulae resulting from experiments: it doesn’t matter. There is undoubtably a connection between mind and body but since the brain is an unbelieveably complex organ and the whole of reality will probably never be fully explained by science I wouldn’t discount esoteric explanations of observable phenomena outright. In short: when it comes to ki I am and will probably remain an agnostic. Seriously though: why would you want to strike bone in order to do damage if you can strike soft tissue and vulnerable spots and achieve equal if not greater results? The boardbreaking practice probably was useful and even mandatory once (striking through armor presumably) but nowadays almost no one wears body protection so all targets are readily available if you know how to exploit them. To the guy who stated his training is about breaking the human body: letting the ground do the work for you (a high impact fall on concrete will do the trick just fine) and/or learning joint locking techniques that’ll dislocate or break joints with minimal effort is far more effective and efficient than trying to strike through bone which is by nature very resilient and hard. Personally I’d try to avoid maiming, crippling or killing someone if I can (even if they attacked me first) since judges usually don’t take kindly too that and again: if lethal force is justified there are far better methods, armed and unarmed. Unless you live in a slum, a warzone or have an especially dangerous job chances are very slim you’ll ever have to fight someone to the death and I’d be more than happy about that. Board breaking, could be more of a matter of speed, focus, confidence, and mental challenge, rather than a test of actual ability and power. And I will say it doesn’t have to be someone trained in martial arts to break a board.